Double Honor Cords: Two Single honor cords are tied together and that pair becomes double honor cords. 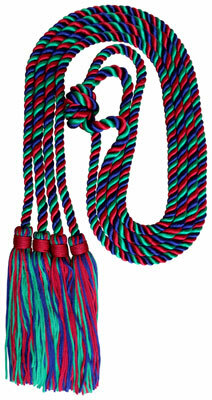 Double honor cords are available in all the stock colors as well as all multi colors as per the user requirement. Customer can mention their specific color request in the Special instruction box while placing the order online. Customer can also send in their request via email to sales1@Indianproduct.Com Or call our customer care at 219-663-3044. We have been serving thousands of Schools and Universities in the whole United States for the last more than 25 years. We are wholesale supplier of most of the graduation items like Honor cords, graduation tassels, Gradation stoles, Caps and gowns, Doctoral Gowns, hoods and lot more!!! We accept purchase order, Checks from all the School and universities. We can assure you of very best quality product at lowest prices with the best customer service.